The two teams approached this game from very different positions, but both were focused on the number four. The Miami Marlins (75-75) were four games back of a wild-card slot.1 The Washington Nationals (88-62) had a “magic number” of four to clinch the National League East. The Nationals seemed sure to win the division, needing only four wins (or New York Mets losses) with 12 games to play, but they had lost their last three games. The pitchers, Tanner Roark (2.75 ERA) for the Nationals and José Fernández (2.99 ERA) for the Marlins, had identical 15-8 won-lost records. Fernández had a 3-0 record against the Nationals in 2016. Indeed, he had never taken a loss in a game against the Nationals since his debut in 2013, although there were a few no-decisions. Roark, for his part, had four 2016 starts against the Marlins and had lost three of them, with an ERA over 6. It must have been something about the Marlins: Roark led the majors with nine starts with no runs allowed. Although the roof was closed in Marlins Park, the 77-degree temperature inside led to a sweaty outing for both pitchers. After Trea Turner grounded out to open the game, Stephen Drew lofted one over Giancarlo Stanton’s head in right. The ball bounced off the fence and Drew pulled safely into second. Bryce Harper flied out to Marcell Ozuna in left-center: Drew started to tag, but decided not to challenge Ozuna’s arm and stayed at second. He was left there when Tony Rendon popped up to Martín Prado in foul territory. Despite his less-than-stellar history against the Marlins, Roark had no trouble in the first inning. Dee Gordon grounded out gently to Clint Robinson at first, Ozuna struck out, and Prado lined out to Drew at second. In the top of the second, Fernandez made quick work of the Nationals on 13 pitches: Robinson flied out, Wilson Ramos and Brian Goodwin both struck out. Christian Yelich singled to open the bottom of the second. Stanton (wearing his specially designed batting helmet with the additional C-shaped face protection) blooped one into shallow right, but Harper had no trouble catching it. Justin Bour’s ball also found Harper’s glove. J.T. Realmuto popped out to Robinson, who caught the ball while leaning over the Nationals’ dugout railing on the first-base side. The top of the third was another efficient 1-2-3 inning for Fernández: Danny Espinosa struck out, Roark and Turner grounded out. In the bottom of the third, Adeiny Hechavarria was out on a close play: The ball skipped under Rendon’s glove, but Espinosa was right behind him to grab the ball just in time to make the out at first. Fernández struck out looking for the second out. Then Roark got into a bit of a jam. Gordon singled up the middle. Perhaps distracted by throwing over to keep Gordon close, Roark walked Ozuna on four pitches. (Gordon had led the majors in stolen bases the previous two years.) He then walked Prado on five pitches to load the bases. That may not have been a bad idea: Prado was 10-for-21 career against Roark. Mike Maddux, the Nationals’ pitching coach, made a quick mound visit. Perhaps it helped, as Yelich lined right to Espinosa, leaving the bases loaded and the score still 0-0. In the top of the fourth, Drew battled for seven pitches but finally was out swinging at a changeup. Harper lined out and Rendon struck out on three pitches to finish the half inning. The bottom of the fourth was not so tidy. Stanton worked a full count and then walked. Bour grounded into a fielder’s choice: Stanton was out at second. Realmuto grounded to Espinosa for another out at second, but Drew’s throw to first was up the line so Realmuto was safe: no double play. Hechavarria ended the inning with a soft tapper to second. Fernández worked another 13-pitch inning in the top of the fifth. Robinson lined out, Ramos struck out looking, and Goodwin struck out swinging at 98. Roark had a much easier bottom of the fifth: Fernández struck out swinging; Gordon tried to bunt twice, then swung through an elevated fastball; and Ozuna grounded out – all on eight pitches. Espinosa tried to bunt for a hit to open the sixth but bunted it only a few feet in front of the plate, so Realmuto threw him out at first. Roark worked the count full, but struck out. Turner struck out as well. In the bottom of the frame, Roark got two quick outs: Prado grounded out and Yelich lined out. But Stanton finally broke the scoreless tie: His solo home run (number 27) into the seats in right was the only score of the game. Bour grounded out to end the inning. Now that he had a lead, Marlins manager Don Mattingly took Stanton out in the top of the seventh and put Ichiro Suzuki in right for defense. Fernández worked his sixth 1-2-3 inning of the game: Drew struck out looking, Harper flied out to Yelich, and Rendon grounded out to third. Roark responded with a nine-pitch inning: Realmuto grounded out and Hechavarria flied out. Then Fernández came up to bat. He swung at three pitches, and walked back to the dugout laughing at himself for swinging at a pitch in the dirt to strike out. Fernández pitched the eighth inning for the first time since April 2014. Robinson struck out swinging, twisting himself into the dirt. Ramos blooped a hit into center, the first hit for the Nationals since the first inning. Goodwin took one pitch, then Nationals manager Dusty Baker put Michael Taylor in to run for Ramos. Goodwin hit a chopper over the first baseman, moving Taylor to third. With Espinosa up, Kyle Barraclough started warming in the pen for Miami. Espinosa struck out swinging at a changeup away for Fernández’s 12th strikeout of the game. With runners on first and third, Baker brought in Daniel Murphy (and his .348 BA) to hit for Roark. But Murphy hit a broken-bat groundout to end the Nationals’ threat. Fernández returned to the dugout to the congratulations of his teammates and Barry Bonds (the Marlins’ hitting coach). Bonds had been teasing Fernández about not pitching deep into games. Eight innings on 111 pitches apparently met with Bonds’ approval. With both starters out, the game was in the hands of the bullpens. Shawn Kelley made quick work of the Marlins in the bottom of the eighth: Two strikeouts and a foulout completed the inning. Mattingly called on David Phelps to close out the game. Turner was the first out on a broken-bat comebacker. Drew also hit a comebacker, off the back of Phelps’ leg: The ball ended up behind the mound. Phelps grabbed it as he fell to his knees. Realizing he had no play, he held onto the ball. Baker put Ben Revere in to run for Drew. Harper was out looking at a strike that appeared to be outside the zone for the second out. Rendon was the Nationals’ last hope: He hit a grounder up the middle. Gordon grabbed the ball behind second and dove for the bag to beat Revere for the final out, and preserve the win for Fernández. Unfortunately, Fernández died in a boating accident less than a week later in the early morning hours of September 25. Fernandez's next start had been pushed from September 25 to September 26 to make room for Adam Conley's return from the disabled list.3Who knows what Fernández’s future would have held had he not taken the wheel of the Kaught Looking that night. All we have is his body of work, ending with this; his last, best game. 1 Although this win gave the Marlins a three-game winning streak, they lost seven of their last 10 games and finished 15½ games back of the Nationals (the Marlins played only 161 games, as the game after Fernández’s death was canceled and not rescheduled, as it would not have affected the standings). 2 “Prado: Fernandez Told Teammate His Last Game Was His ‘Best Ever,’” CBS Miami, September 25, 2016, miami.cbslocal.com/2016/09/25/prado-fernandez-told-teammate-his-last-game-was-his-best-ever/, accessed October 12, 2018. 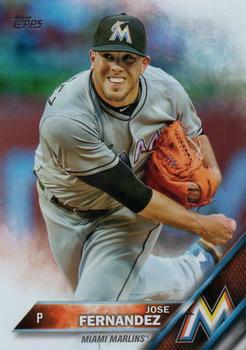 3“Jose Fernandez Dies in Boating Accident,” ESPN, September 26, 2016. espn.com/mlb/story/_/id/17632541/miami-marlins-ace-jose-fernandez-dies-boating-accident, accessed October 12, 2018.